This month I’ve reached the first major goal I had for this blog – 100,000 individual views. 100,000 individual views is not bad for a one man band. It is a joy to know that something I love so much, small layouts combined with operation, could be something that inspired so many of you to come along with me on this ride. I’d like to thank you all for your time, not only to view, comment and write emails but for the personal lift I’ve received when you did so. The model railroad hobby can often be a lonely thing. Working so far from so many of you, in regional Victoria, in southeastern Australia while modelling primarily US railroads would not be possible without the help of so many of you. Looking forward to hitting the quarter million view mark as the next milestone. I hope that you’ll stay along for the ride. A recent conversation with a fellow modeller has bought me back to thinking about why I’m modelling, and what my modelling should represent. Let me explain. I have a lot less modelling time now than I ever did before, due to my work commitment, which is driving the nature of my modelling in different (if interesting new) directions. Among the changes I’ve had to make is in the scope of the work. Because it takes longer to complete larger and more complex projects I’m focusing on smaller easier to complete in a day projects as my primary goal. I have some large projects that remain on the table. These will be for items I cannot buy, kitbash or otherwise make out of something else. Will this change the nature of posts that appear here on the Andrew’s Trains blog? No, I don’t believe so. This blog has always been about small layouts with lots of operational potential, and that is in line with what I am moving to in my modelling. Weathering will continue to play a large part in my modelling, upgrading blue-box style kits to better reflect the prototype is where I found real joy in modelling as a young man. And I’m going back to that in a big way this year. There’ll be more posts along these lines to come over the next few months as I get my modelling life back in order. that can be completed in the time I have to give them. This is the focus of my modelling going forward. Likewise to layout building. I have a couple of projects that I want to complete, one of which is a Supernook, a new design I’m working on now that will begin with the baseboards build before we left the USA 13 years ago. I’ll be continuing on with the US-based shunting layouts, but I’m interested in building a Australian/UK-based Minories layout soon as well. I’ve made modelling a complex and often difficult endeavour. I’ve lost my love of producing models that I enjoyed building and that I am proud of. Life is short, and more so as I near my mid 50s. Time with my family and enjoying what I do is not limitless. So the time is now to make the changes that keep me happy, healed and enjoying what I do. I hope that you will stay along for the ride. With almost 100,000 unique views over the last 3 years I’m hopeful that you will stick around and see what is coming. Imagine an industrial 7mm narrow and standard gauge model railway with radio controlled crane and lorries. Then look at a great video and see it in action. Built by a group of four during a three-month period for a club exhibition. This layout is in 7mm scale and uses both 16.5mm (3.5mm HO standard gauge) and 32mm (7mm O scale gauge) track. Scenic area is only 2’2” x 6’, with an overall size of 2’2” x 9’ including fiddle yard. The gantry crane had apparently been on another layout and manually controlled. When moved to the yard it was converted to radio control. The lorries, which I believe are the work of Mr Giles Favell, (see the resources section below for more) were in use on other layouts. The rolling stock came from other layouts also. Control of trains is by DCC, while point control uses MERG canbus. We moved back to Australia in 2006. So, I have to live through others when they visit David Barrow in Austin Texas, my wife’s hometown, and where we spent 10 years from 1997. 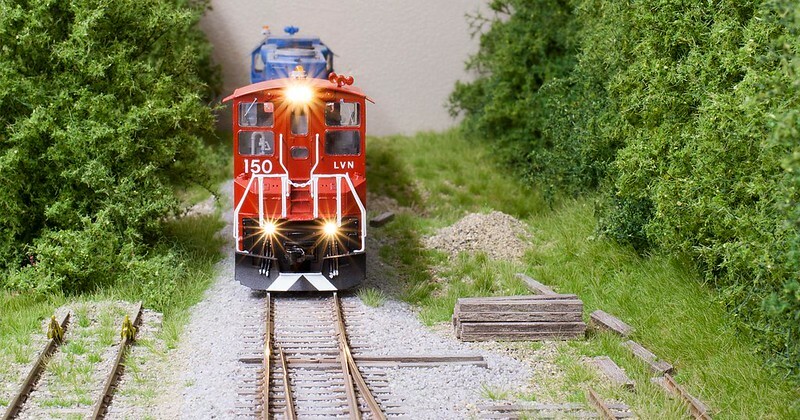 Trevor Marshall visited recently and came away with a great post on the man and his layouts – including his new small (comparatively speaking) O scale layout which really piqued my interest. I first remember reading about David Barrow’s Cat Mountain and Santa Fé layout in the 1980s in Model Railroader magazine. As a young man, dreaming about my large future model railway plans, David’s layouts (there were at my last count about 17 versions of the Cat Mountain) were my ideal. While I dream of those massive layouts still I took another path to small layout designs. Recently David Barrow has followed down that rabbit hole, this time in O scale, with a new layout. You can read more about that in the second link below by Trevor Marshall. David’s layout design and presentation skills are unique in the hobby. Not to everyone’s taste I’ll grant, yet having seen and operated on the layout once in 2005, I did not notice its minimal scenic treatment. I was too interested in the operational side of things. You can out more on this layout in the Model Railroad Planning 2018 publication from Kalmbach. I admire modellers who can get to the meat of a project, quickly and with vigour. Gazmanjack (Gary) on RMWeb used second-hand track, wood and other parts from his modelling left-overs to create a stunningly good small layout for operations. Read on for more. Gazmanjack (his handle on RMWeb) back in 2014 built an outstanding layout from left over bits and pieces, as an adjunct to his current layout, to give himself something to operate on during the other layout’s longer build. I’ve only just found it and wanted to share the forum post with you. And what a cracker this layout is. I won’t go into too much detail here, as I think the adage of a picture telling a thousand words is true on this occasion. There is plenty of information in the post too on the build including scenery, tree armatures, and so on. I hope that you find inspiration in the post. So much with so little that turned out so well. Well done Gary! Small switching layouts are plentiful. Seb has taken this layout to an awe-inspiring level. Over on the RMWeb forums Seb has served up some serious eye candy with photos of his in progress layout. He describes his freelance layout as “a short line located somewhere in the NE, near the Canadian border”. The track plan is simple and efficient; main track, runaround, and sidings. There are two major customers served by the LVN : Lakemont Packaging & Farmers Coop Elevator. Are also served a team track, an unloading dock and unloading pit with auger. His attention to detail and his execution of the built and natural shown in the image below (click the photo to go directly to the forum) are outstandingly good. There are many more photos on the main thread on RMWeb. Head over and read through the full thread and see a lot more photos of the layout. You’ll thank me once you’ve visited. Clicking the image will take you to another thread where many of Seb’s images from Facebook have been linked and shared for those not on the specific Facebook group. Operating realism is very important to me. It ensures that those working my layouts move at a realistic pace and in a realistic way. Switch operation is a big part of that goal for me. Originally inspired by a post on Trevor Marshall’s Port Rowan blog, I want to include these switch stands as a part of my operating realism approach. I particularly like the fact that Trevor uses a single style of padlock to lock the switches along with a length of chain. This ensures that all switches must be unlocked before use, and relocked after use as happens on the 1:1 railroad. As Trevor says in the blog post, they are more expensive than other simpler options. However, I think that if you have a small layout, and realistic operation is your thing, then the cost is worth it. And they’ll last forever. I’ve wanted to share this post for a long time, but only recently found all the links again after long searching. I hope you enjoy reading about this and get inspired. In my August 18 post we looked at modelling and using Blue Flags for your operating sessions. Thanks to Charles Malinowski’s timely reminder, there’s an additional video for context. Model Railroader magazine has a series of videos (most are pay to play). However some of the best of them are free for you to watch. One of these focuses on the SMS Rail Lines industrial park in New Jersey. I did try to embed their video (as they offer this as an option – like YouTube) however, it didn’t work. Instead you’ll find below the link for the video. THis will take you straight to the page and then play away. The video is narrated and professionally shot and edited. It is really well done and shows the operations in the Industrial Park and the blue flag in action. Thanks to Charles for reminding me of the video. I hope that you all enjoy watching and learning. Don’t forget to comment on and share this post with your friends. Locomotive dead lines make fascinating modelling subjects. One layout idea that has percolated along for the last couple of years relates to a locomotive rebuilder. A recent post by one of my favourite modellers, Mike Confalone, over on the Model Railroad Hobbyist forums, provides a great starting point. There’s five pages of comments and information there as of my writing this post. Being a fan of Mike’s work I may be biased. However, I find his work to be of the highest quality and well worth the time to review. I hope that you feel the same way after you’ve read through the thread. In this post we’ll be looking at blue flags; what they are, what they do and how to model them. Blue Flags are used in the North American railroading industry to show that railroad or other personnel are working, on, about, under or between railroad equipment and that the railroad equipment may not be connected to. These signs may be posted at the entry to the track upon which the vehicle sits or may be at, or close to, the railroad equipment itself. Whoever places the flag is generally the only person that may remove said flag. However anyone from that same ‘craft’ may remove the flag. While this generally applies to railroad mechanical departments many customers have also begun to use the blue flag to ensure that cars loading or unloading have the same level of protection. Railroad crews are so used to dealing with these safety items that ‘everyone’ in the industry understands what their placement on a siding or spur means. 12.3.7 Blue flag protection is used to indicate that CP or Contractor Personnel are working on, under or between Railway Equipment and movement of trains or other Railway Equipment is prohibited. Blue flags must not be tampered with or obstructed. Blue flags can only be removed by the person or group of persons who originally applied it. Application, use, and removal of blue flags, when appropriate, may only be done under the authorization and guidance of the Manager in Charge. It slows down the session and forces you to work in real-time. Over on the Model Railroad Hobbyist blog of Craig Thomasson he recently described how he builds HO scale blue flags for operations and how they are used on his layout. I found his blog post interesting and think that you might find as interesting and useful as I did. The Wikipedia listing for the General Code of Operating Rules (GCOR). This includes two links for a PDF of the 2010, and 2015 versions of the rule book.